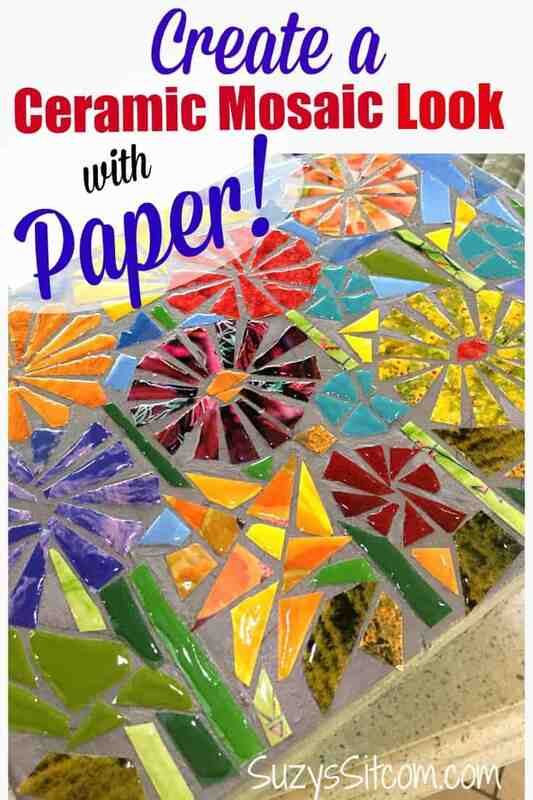 Learn how to create recycled magazine art that looks like a faux ceramic mosaic with paper. It’s a great way to recycle magazines and colored paper! 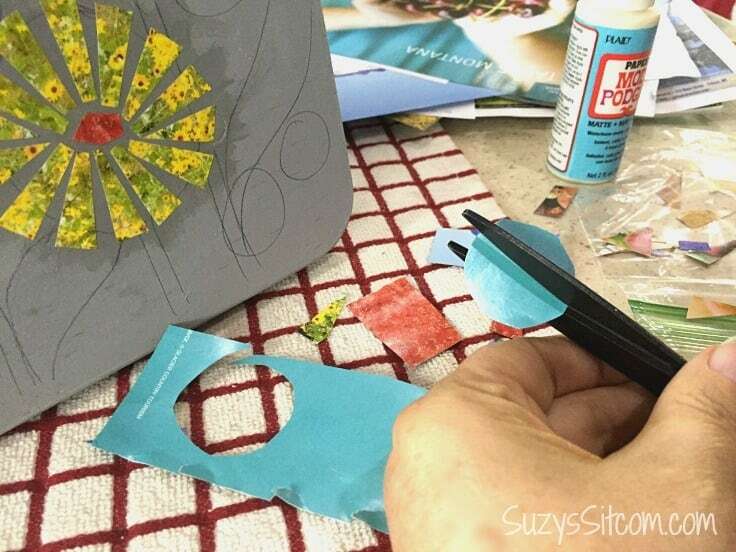 This easy recycled magazine art uses a technique that makes paper look like ceramic mosaic tiles! I’m Suzy from Suzy’s Sitcom. Creating beautiful home decor from recycled items is one of my passions. I’m so happy to share with you one of my favorite techniques, creating a ceramic mosaic look with just paper! 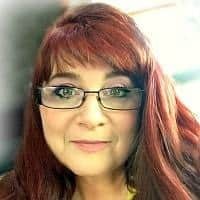 My husband and I travel and live full time in our RV experiencing as much of the country as we can. Where crafts are concerned, I am often influenced by the places that we go and the people that we meet. This project was created as a way to use up a stash of color magazines and travel brochures that we had accumulated. Creating beautiful recycled magazine art is one of my favorites! Like this beautiful framed artwork. In a 400 square foot home on wheels, we don’t have a ton of room for things. So crafting must occur! 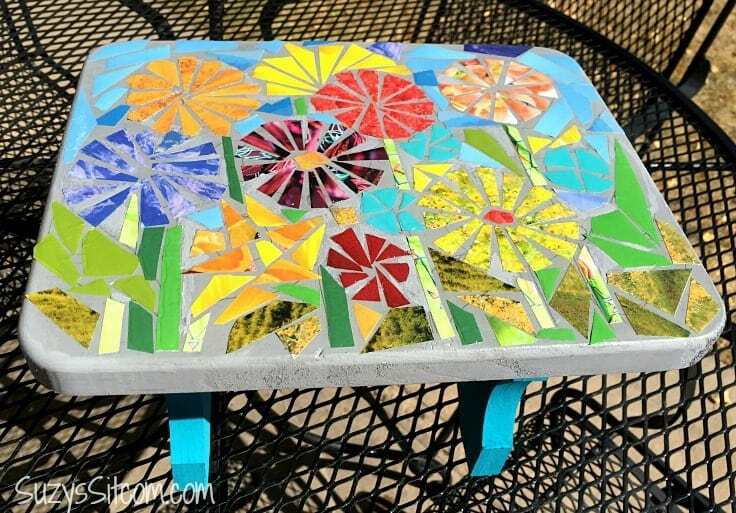 How to Make Recycled Magazine Art Look like a Ceramic Mosaic! For this project, I decorated a small stool using travel brochures, but any color magazines or bright paper will work! Paint the base of the stool with teal acrylic paint. 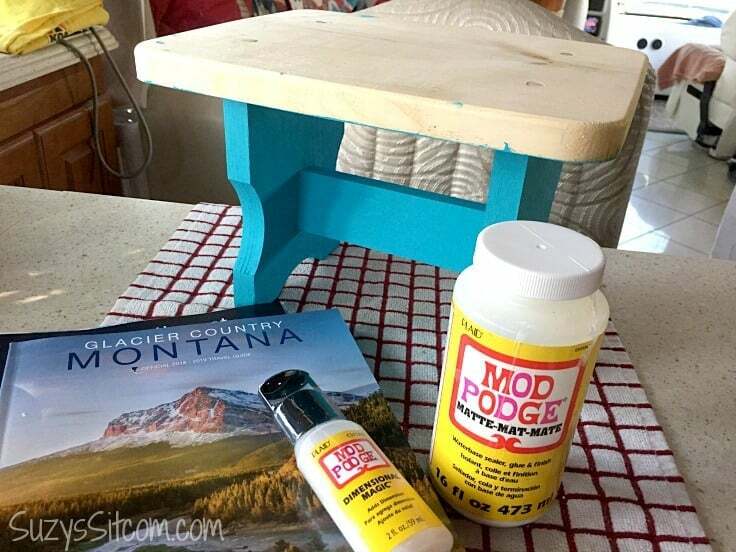 Use the gray acrylic paint for the top of the stool. 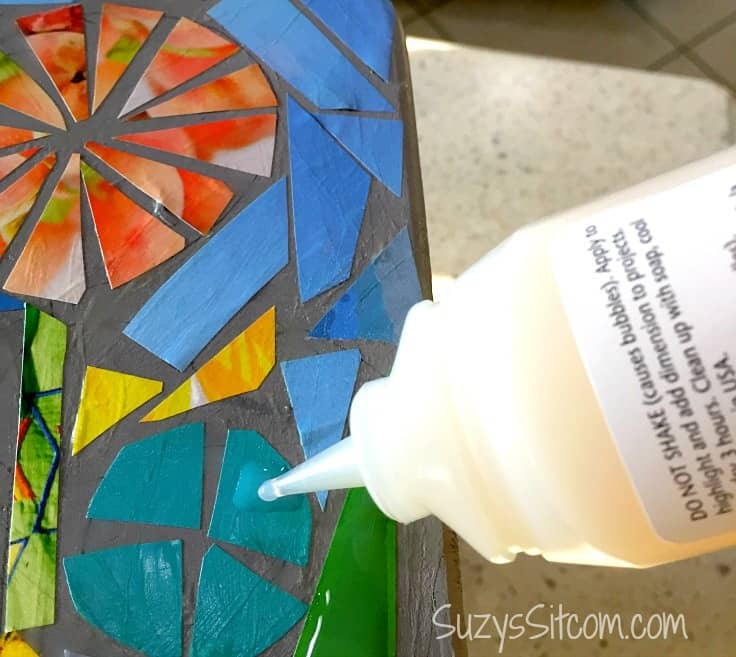 The gray paint will serve as your “mortar” or “grout” in the mosaic. Choose some brightly colored paper and begin cutting out shapes. As you can see in the photo above, I had used charcoal to draw in an idea of the flower outlines. You can also use chalk if you have it on hand. 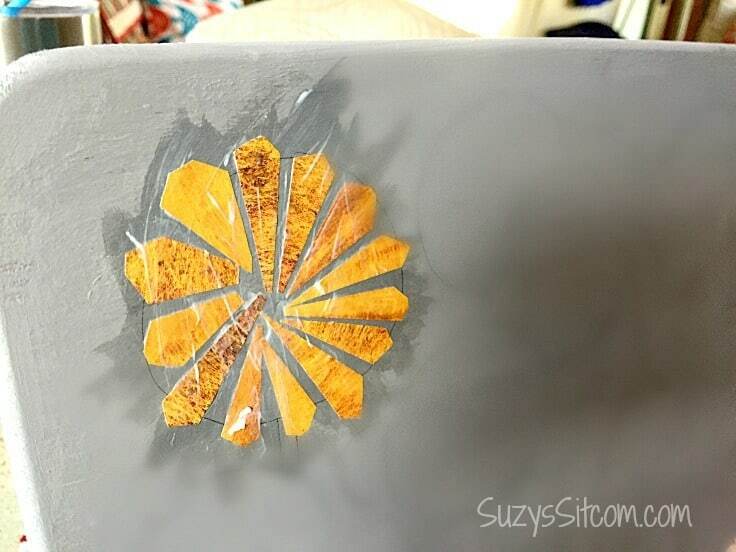 (Be sure to rub the outlines out before applying the Mod Podge). 2. Create the paper mosaic. Brush a small section of the drawing with matte Mod Podge. Place colored paper pieces over the Mod Podge and then brush Mod Podge over them. This will hold the paper from your recycled magazines in place. 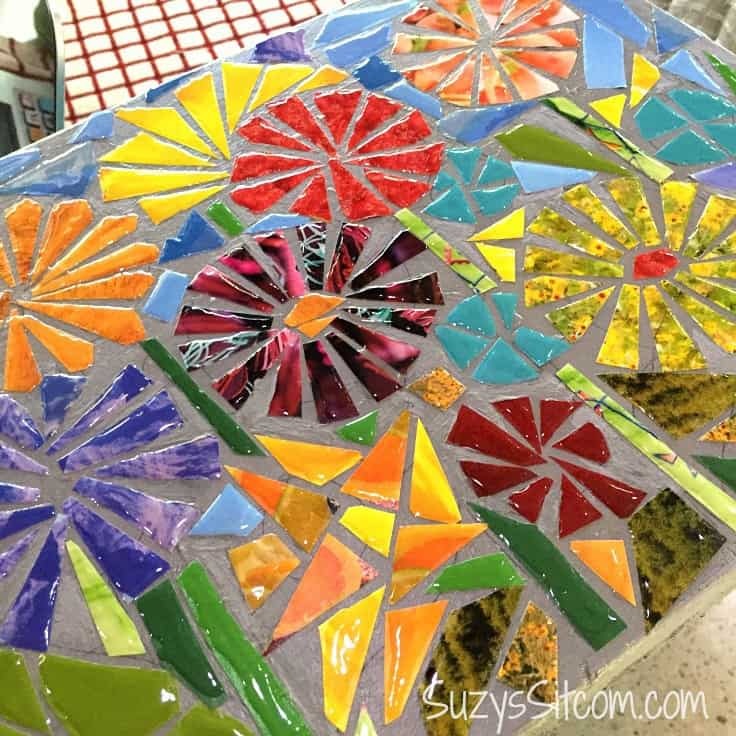 Fill the rest of the stool top with brightly colored pieces of paper being sure to leave spaces between the paper to represent the grout in a mosaic. There is no wrong way to do this recycled magazine art! Mod Podge Dimensional Magic is the secret to turning your paper pieces into the look of ceramic. Simply squeeze a small amount of Dimensional Magic on each individual piece of paper and use the tip of the tube to spread it. (Do not shake the bottle or it can result in bubbles). Apply the Dimensional Magic to the paper pieces and not to the grout areas. 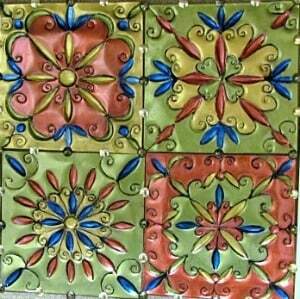 This will create the look of mosaic ceramic tiles. 4. Allow the project to dry. It will take the Mod Podge Dimensional Magic about two hours to dry completely. 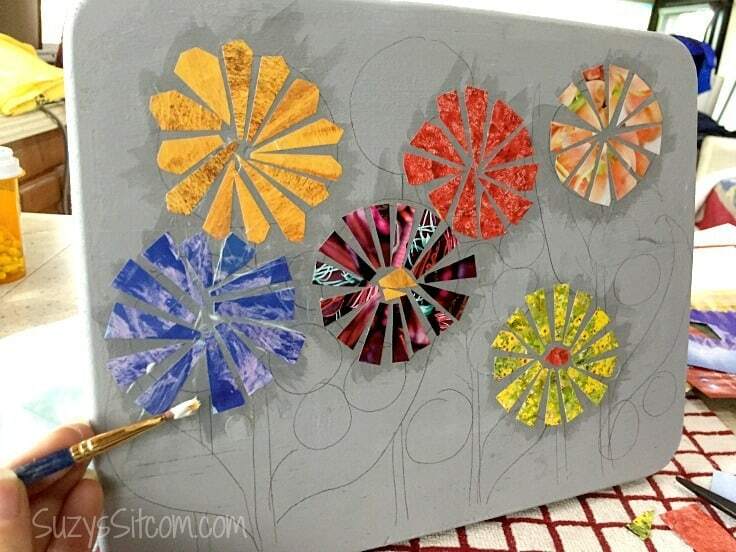 It will dry to a clear, shiny finish that brings out the vibrant colors of the paper. 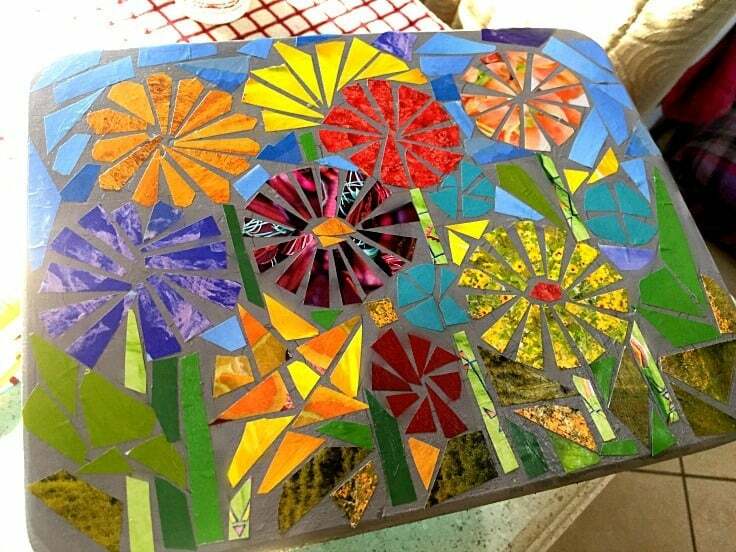 The result is a beautiful mosaic tile piece of recycled magazine art with the look of ceramic tiles. What a great use of recycled paper! This little stool will brighten up your home and creates a colorful centerpiece for any room. What else can you create with this technique? How about a pretty frame, table top, lazy susan, or wall art! 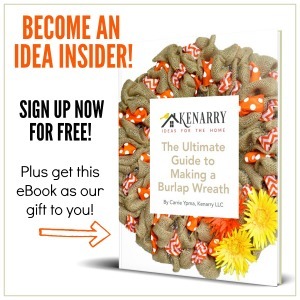 There are so many possibilities for this faux technique! Here are a few more of my projects made from supplies that just might surprise you! 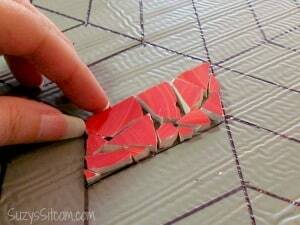 How to make Faux Tin Tiles from Cookie Sheets! 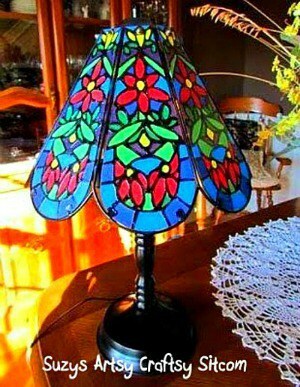 How to make a Faux Tiffany Lamp from a Thrift Store Find! 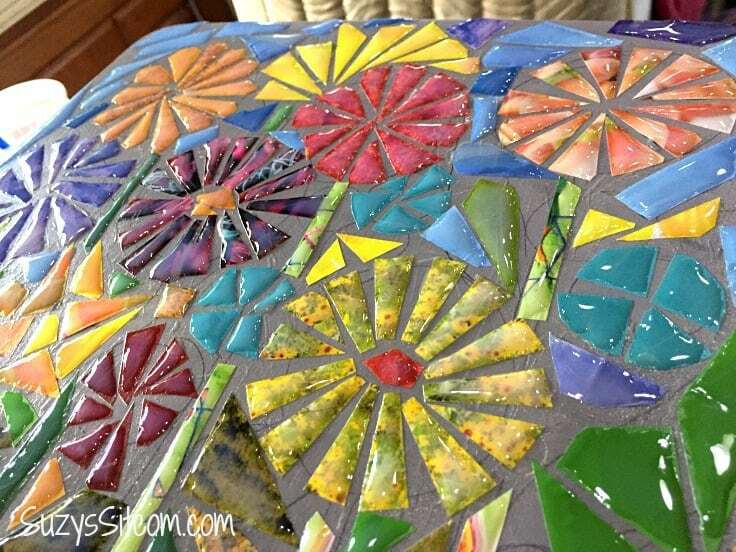 How to Make Mosaics the Easy Way! How to Make Mosaic House Numbers (The Easy Way)! Very cool! I can’t wait to share this with my sister. Thank you for share it with us.